It's possible, I think, to appreciate the fact that Alan Yau is an extraordinarily successful and talented restaurateur, whilst at the same time not being one hundred percent delighted with the reality of eating in his restaurants. Clearly Wagamama is a long way removed from the concept he originally drew up and is easy to criticise in its current high-streets-and-airport-terminals format, ditto Busaba Eathai, but even the food at flagship Hakkasan left me a bit cold, and I didn't get on with Duck & Rice at all; £12 for Singapore fried noodles? No thanks. But what all his sites unarguably do have going for them is style. Hakkasan is drop-dead gorgeous. The stained-glass windows and marble fireplaces in Duck & Rice take your breath away. And though it's often hard for restaurant nerds like me to admit it, a million-dollar interior and sparkling service are quite often more than enough in of themselves to create a special sense of occasion and give punters a good time, even if what appears on the table is more ordinary. Everyone has different priorities, and I can't begrudge anyone favouring a bit of razzmatazz and nice expensive handwash in the toilets over groundbreaking cuisine, I'd just be surprised if any of them read this blog. So in accepting an invitation to Park Chinois I though I knew more or less exactly how the evening would go. Firstly, I knew that the interiors would be impressive, and indeed they were - every inch of the place glitters with opulence, from the intricately-patterned banquettes to the jewel-box bar of crystal and gold. I was also expecting service to be smart and attentive, and that came true too - though we had some issues with their taste in food (more on that later), each member of staff was sharp as a button the whole evening. But I also assumed that the food would end up playing second fiddle to everything else going on, and on that score I'm happy to report I was completely wrong. Because the food at Park Chinois is, as far as we could tell from our limited sampling of the vast menu, exciting and unusual, unashamedly high-end Chinese food at unashamedly high-end prices, but all presented immaculately and, with very few exceptions, complex and rewarding to eat. The evening meal began, as is encouraged at Park Chinois somewhat counter to how Chinese dining usually works, with "dim sum". All the usual suspects - har gau, siu mai, one green one and one with truffle - and all very good examples of their kind, arriving with a lovely fruity chilli sauce and smoky chilli oil. Next, steamed egg, a dish I'm reliably informed is pretty difficult to pull off successfully. My friend, who I was eating with that night and who's written a book on the subject (Chinese food, not steamed egg dishes specifically) said this was a very good version, and I'm not about to argue with her. Sprinkled on top were miniature dried 'Sakura shrimp', which added a nice rich seafoody note. Chicken with Thai basil used clever (and presumably quite difficult, given I've not come across this dish before) cooking techniques on good quality chicken, to great effect. With a delicate, crisp skin and a flesh that seemed almost exaggeratedly packed with flavour - perhaps it had been poached in stock at some point, who knows - it was one of the most enjoyable ways with poulty I'd encountered in a long time. We'd allowed our waiter to steer us towards the next course, a kind of prawn curry with okra, and I'm afraid this ended up being our least favourite dish of the evening. There was nothing exactly wrong with it, and in fact the prawn itself was very nice, plump and full of flavour, but there wasn't enough of interest in the sauce and, well, okra is okra no matter how much you dress it up. I can't complain too much though - the staff at Park Chinois have a difficult job, guiding a diverse London clientele through this overwhelmingly large and complex menu, and I can't blame them for occasionally playing it safe. And all was forgiven once we'd mopped up the last of the next dish, a gloriously messy and powerfully-flavoured thing that paired salty, buttery king crab with an umami-rich black pepper sauce. This is, in essence, what high-end Chinese dining is all about - premium ingredients, treated well, and presented with an unpretentious yet appealing flair. There's nobody can cook vegetables like the Chinese, and these peas and lotus roots, dressed in a thick, salty dressing, were interesting enough to stand on their own as a main course - indeed the menu has a section called "Tofu and Vegetables" not anything as dismissive as "sides". 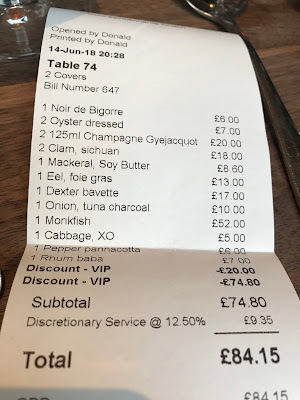 On a menu such as Park Chinois', which boasts something called "Large Supreme Fish Maw 5 Head" for an eye-popping £1,100, and goes out of its way to point out that a £110 sea cucumber dish is indeed "for one person", a £35 "carbonara" involving sea urchin and guanciale and made not from spaghetti but from udon noodles seems almost like a reasonable proposition. So of course we had to order it, and, well, it's every bit as odd as it sounds, poached egg and funky sea urchin flesh combining with slimy noodles to produce a kind of fishy "garbage plate", topped with edible flowers because why the hell not I suppose. We ate it. We probably wouldn't go out of our way to do so again. But part of the fun of eating at Park Chinois is the mad anything-goes approach of the menu and I really wouldn't want to change anything about the way they go about things (not least this apple cheesecake fashioned into the shape of an apple). It's a complete one-off, this place, unlike anything else in London and most probably also the world. Yes, it's crazy expensive but then they're serving crazy expensive ingredients and if you wanted to have a taste of the place without going full 2nd-mortgage-abalone-and-caviar then they do 3 courses at lunchtime for £30. I mean you can have lunch here for £30, that is undoubtedly a fact. 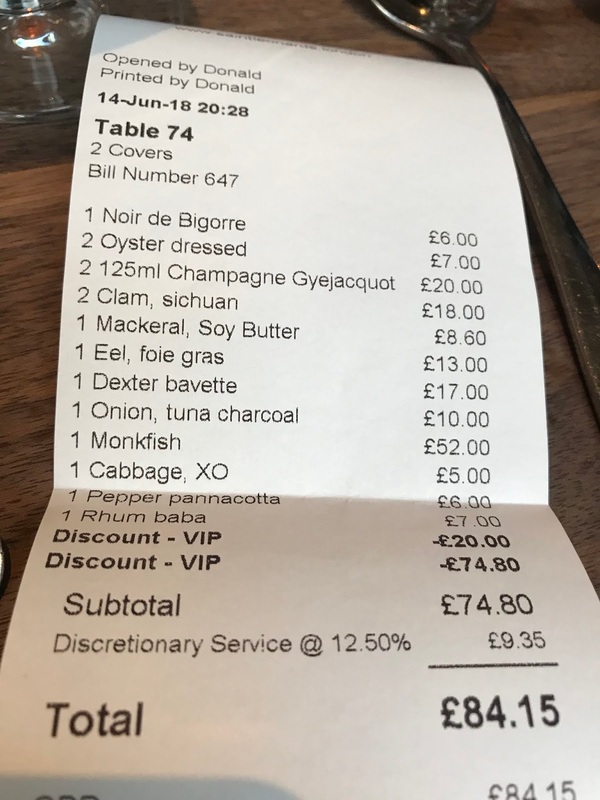 Of course, most Park Chinois guests will not be leaving with a bill of less than £50, or even £100, or even many times that. It's a very special, special occasion restaurant aimed at people that have the means to order caviar and fine wines with a straight face, and a much smaller group of people who will save up for a rare evening of utter decadence and excess. If this sounds like the kind of thing you'd enjoy, then Park Chinois will surely not disappoint; this is most likely the best version of this kind of restaurant - whatever the hell kind of restaurant Park Chinois is - that London has to offer. So go on, treat yourself. I was invited to Park Chinois and didn't see a bill. I shudder to think how much the above would have cost. Maybe £300 total? 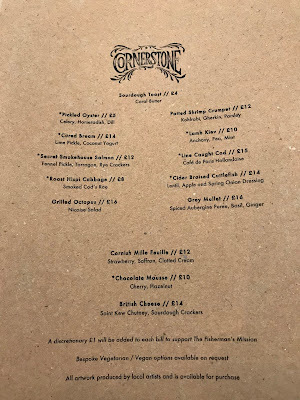 Cornerstone is a Modern British restaurant on the ground floor of one of those utterly charmless new blocks that have sprung up in the East End on the sites of what used to be junk yards or derelict warehouses. This is hardly their fault - these days a London restaurateur must take whatever's available - but it does mean that whoever's doing the interior design has a bit more of an uphill struggle in investing a bit of soul and personality into a dining space. It's not that Cornerstone is ugly, as such (he says diplomatically), it just feels unfinished; the concrete floors aren't quite polished (or even) enough to feel deliberate, and though black curtains cover up the worst of the bare plasterwork on the walls, one whole end of the restaurant is raw MDF painted black. Usually the amount of effort a place has made on its interiors is of supreme unimportance - one of my favourite restaurants in town is Silk Road, which is like eating in a hospital waiting room - but when my attention starts to wander to my wobbly table, or the fraying raffia on my chair, it's usually a sign that there's not enough happening elsewhere to make up for it. 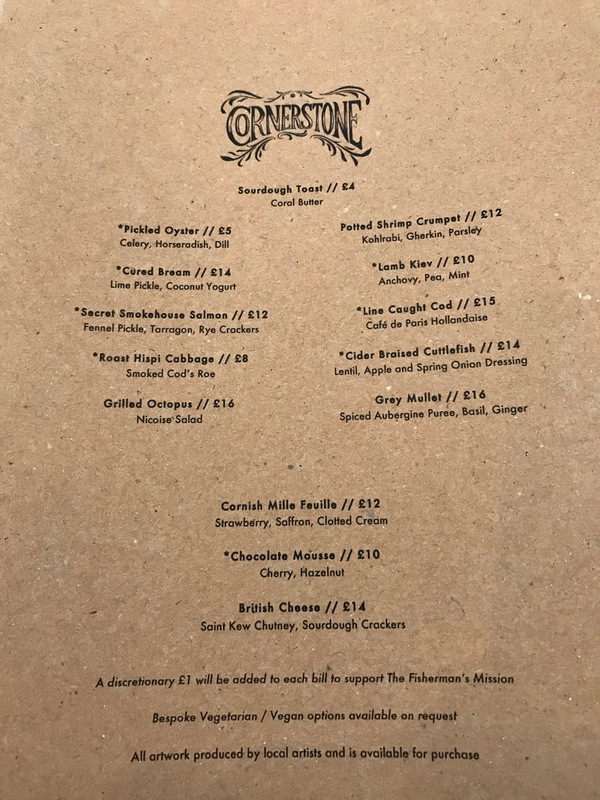 Take the Cornerstone menu, for example. Bream, smoked salmon, cabbage, cod, lamb... I'm acutely aware I sound like a right spoiled, whinging so-and-so pointing this out, but this is Hackney - I'm certainly not the only one - and this is not a particularly inspiring list of main ingredients. I read it a few times before eventually realising there wasn't anything on it I really wanted to eat. But anyway, we were hardly about to get up and leave, so hoping the £45 'chef's choice' selection would at least be a reliable highlight of what they had to offer, went for that. And in fact, the "Pickled oyster" wasn't half bad, maintaining a nice balance of seafood brine and vegetation, with little chunks of celery providing some nice texture contrasts. Yes, there are better dressed oyster dishes in town - take a bow, St Leonard's - but this was perfectly decent. Better was bream, apparently marinated overnight in almond milk a bit like a proto-ceviche, topped with tangy blobs of lime pickle and coconut yoghurt. I liked how the fish was presented in clean, defined fillets like sashimi, and the vaguely South American thrust - it was fresh and lively and enjoyable. Sadly, the bream was to be the highlight of the meal. From here on, nothing much else set the pulse racing or was even particularly memorable. Smoked salmon - sorry, "secret smokehouse salmon" though don't ask me what was secret about it - was fine in the way that good smoked salmon generally is, and I enjoyed the little lumps of vegetable jelly. But even the best smoked salmon will only ever be, well, smoked salmon, and this would never be a good enough reason to travel to Hackney for dinner. The rye crackers were bordering on inedibly hard, too. Hispi cabbage seemed quite soggy and bland, suffering badly in comparison to the version with 'XO crumb' served at St. Leonard's last week, and in fact also to the version at the wonderful Hispi bistro in Manchester. The smoked cod's roe was good, but I was a bit unsure as to how to combine this with the cabbage, as the roe just slipped off the wet leaves. In the end, I ate each separately. Lamb "Kiev" was absolutely no more interesting than the kind of thing you'd get in your local pub (they'd probably call it something like a "pulled lamb shoulder croquette"), and though the filling was perfectly fine in a clumsy kind of way, the pickled anchovies were way too sharp to sit well with the lamb (good salted would have been much more preferable), and the pea purée was cold, unseasoned and pretty unpleasant. There's nothing wrong in theory in reinventing the tried-and-tested lamb, anchovy, pea and mint for a hipster crowd, you'll just need to do it a lot better than this to get away with it. If a competently-cooked bit of cod was the only thing to appear on the next dish, I would have had very few complaints. Never the most trendy of fish, when it's allowed to appear unadorned and unapologetic, seasoned gently and with the flesh sliding into clean, white flakes, it's nevertheless impossible not to enjoy. Unfortunately next to it sat a vast pile of two-dimensional, sour tartare sauce - sorry, "Café de Paris hollandaise" - which was bizarrely misjudged and completely unnecessary. Cider Braised Cuttlefish was, there's no other word for it, boring. Tasteless chunks of seafood in an insipid sauce, wading through it was a chore, and the "lentil, apple and spring onion" dressing served to do nothing other than add a cloying sweetness to the stew. With no umami-rich seafood flavour, in fact not much flavour of any kind, it was all a bit of a waste of time, really. Chocolate cake was a chocolate cake, the kind of thing your local pub would do for about £4.50. Look I'm sorry if I'm sounding increasingly grumpy but I can go anywhere in town - anywhere in the country for chocolate cake with cherry and hazelnuts. It's just not good enough for a restaurant charging £80/head with a couple of admittedly very nice wines. Think of what else you can get in East London alone for this amount of money - dinner at Pidgin, or the Marksman, or Brawn, where the menus are gloriously inventive and feature unusual game and shellfish and offal. So no, I'm afraid I can't really recommend Cornerstone. I've already pointed out a few much better ways of spending your dinner money, but it's probably unfair to assume that every new restaurant in town can leap right into the very top tier alongside places like the above. What I think it is reasonable to expect is a little bit of innovation and risk-taking, a menu you want to devour and explore rather than glumly tolerate, and at least one dish that I'll remember five minutes after jumping on the Overground home. There's every chance that one day Cornerstone could offer all of these things. Until then, I'm staying away. 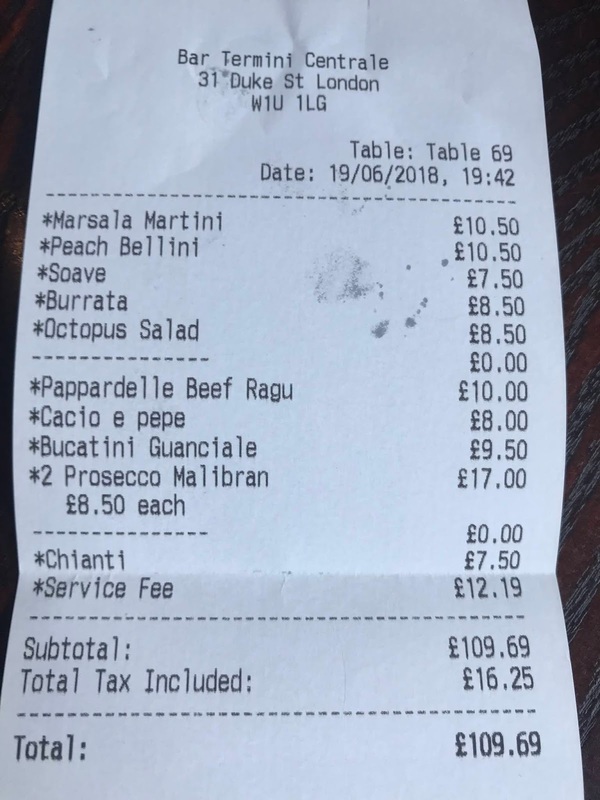 Since the arrival of Padella, the bijou and blindingly popular pasta bar in Borough Market, the race has been on amongst the London restaurant community to emulate its success - or hell, even some of its success - elsewhere in the capital. Results so far, it has to be said, have been mixed. Stevie Parle's Pastaio looked like it might be onto something but could only manage a very weak facsimile of the rightly famous Padella cacio e pepe, and the shared tables are a trial. More recently I bounded enthusiastically into the gleaming new Lina Stores pasta bar on Greek Street, only to be served completely unseasoned tortellini with horrid hard edges. So why haven't proto-Padellas spread out across London, when clearly the demand is there? Well, I'm guessing because making great pasta - and running a great pasta restaurant - isn't anywhere near as easy as Padella makes it look. It's a difficult, laborious job rolling out fresh pasta every morning before service, and all sorts of factors - not least the space to operate in - need to be just right. And any Italian will tell you there's far, far more skill, time and effort goes into the construction of a truly excellent tomato sauce than your average punter would appreciate. Padella is no accident, it's the result of years of experience (the team behind Trullo in Islington, also excellent) and bloody hard work. Given, then, that we're probably not going to be exactly spoiled for choice for great pasta any time soon, all the more reason to shout from the rooftops about anywhere offering a genuinely world-class product. So with that in mind, please let me introduce you to Fat Tony's at Bar Termini Centrale, and the best pasta I've ever eaten in London. It sounds a bit unfair to the scale of what the Bar Termini team have achieved with Fat Tony's to say that quite how brilliant it is came out of the blue. Food this good is always, to some degree, unexpected, no matter how much previous experience is being brought along. If I had been told half the staff of the River Café were working downstairs at this rather functional spot on Duke Street that Tuesday evening I still would have been flabbergasted by the quality of the dishes they were turning out, but from chef James French, someone whose name was completely new to me before the press release landed in my inbox, the shock is all the greater. I hardly need to say, given Bar Termini's pedigree, that the drink offering is amongst the very finest in the capital. Intelligently conceived and immaculately assembled, the Marsala Martini is a thing of stark, clean beauty, balanced and fresh to taste. And the Bellini, similarly stripped-back to its essentials and bathed in a gentle peach glow, is - I believe - spiked with essence of fresh fruit (one of Tony Conigliaro's signature techniques) for extra zing. But OK, OK, the food. Burrata arrived first. A giant, beautiful thing draped in olive oil and speckled with black pepper, it cut open under gentle pressure to reveal a filling of soft seasoned cream, being in every way about as good as a burrata you could hope to encounter in this city or any other. Another starter was wonderful in all kinds of different ways, pieces of expertly-prepared octopus complimented by potato, fresh herbs and a kick of nduja. There are a lot of great octopus dishes in London at the moment - the Holborn Dining Room version is particularly noteworthy, and this stood up to the very best of them. Fat Tony's pici cacio e pepe is about the only version of this dish that has been anywhere near up to the standard of Padella's, and in fact - whisper it - may even be slightly better. The sauce is that same worryingly addictive emulsion of cheese and butter spiked with black pepper, salty and dense with flavour, and speaks of a kitchen that really knows what its doing. But the pici itself was so bouncy and vibrant it was practically alive, jumping around on the end of the fork like a Star Trek special effect. Sorry if that simile doesn't make them sound particularly appetising, but there it is. Pappardelle with beef shin ragu is another classic dish where extreme attention to detail is the difference between a soggy plate of nonsense and a journey to pasta heaven. With soft yet firm folds of pasta bound with an unbelievably rich and beefy sauce, this was very much in the latter camp, again - at the risk of repeating myself - right up with the very best versions of this dish I've sampled anywhere, and probably a little better still. It's also worth pointing out that the generous chunks of beef that appeared in the bowl were tender, flavoursome little things that almost deserve a blog post all of their own. Bucatini is (I discovered) similar to pici but with a hole running through the middle. What this means is that as well as being coated on the outside with the most incredible tomato and guanciale sauce, it bursts in the mouth into even more flavour when you bite into them, which if you've not experienced it before let me tell you is A Very Good Thing. You'll have got the idea by now. Everything Fat Tony's do is (apart weirdly from the house bread, which was a tad stale, but we could have just been unlucky) worth shouting about; yes the pasta is worth crossing continents for but, as I said before, this is no kind of accident. Everything this team has been involved with, even since way back in the days of 69 Colebrook Row, has been touched with a kind of obsessive perfectionism and now they've turned their attention to pasta it makes sense that they've ended up making the best pasta in London, too. Some people are just that annoyingly good at what they do. Anyway, for now I'll let you go and discover it for yourself. With its obsessively-perfect rendition of classical Italian cuisine, Fat Tony's is a singular achievement for its owners and a new jewel in the crown of London dining. If you sit down for a meal here and manage to come away even in the least bit disappointed, then I'll shut down the blog, sell my house and go and live on an island somewhere. 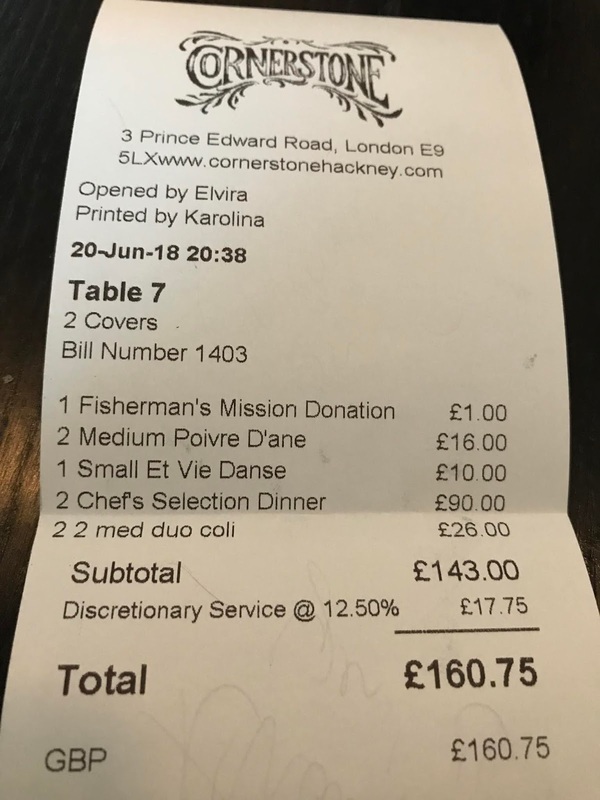 In fact, they've turned me into such an evangelical that despite this meal beginning with a PR invite, I decided to pay my bill in full so that my message wouldn't be diluted. And the message, in short, is this - go and eat at Fat Tony's. It'll change everything. Looking back over the God knows how many years I've been writing this blog, it seems that my most breathlessly enthusiastic and hyperbolic reviews have been of places that are about more than just great food. Great food is obviously a given - this is after all why you're here - but it's the stories that often turn a great experience into a special one. I'm thinking of Yianni's journey from flipping the best burgers in Britain to opening the industry-altering #meateasy popup in New Cross, the discovery deep in the rolling Lancashire countryside of two women running the platonic ideal of a food pub, or when some Italian food enthusiasts decided to open a tiny no-reservations pasta bar in Borough and it ended up being exactly what thousands of Londoners had been waiting for. It's these stories, the unusual or surprising circumstances leading up to the creation of fantastic food, that lift the whole experience into something else. The conception of St. Leonards (that sounds like a Catholic order) has, it must be said, very little of the unusual or shocking. It is the simple story of some extremely talented people who, with one popular and successful restaurant - Brunswick House - already under their belts, decide to open another one. They find a medium-sized site recently vacated by the Spanish restaurant Eyre Bros and open it out into a bright, clean space; they hire a phalanx of charming and dedicated front of house staff dressed in smart monochrome to work the floor; and they kit out a vast kitchen with a centrepiece wood- and charcoal-fired hearth, over which hang various tantalising cuts of beef on the bone and tuna collar. And then, finally, they serve some of the most exciting and innovative food London has ever seen. OK, so, maybe St. Leonards is special after all. Restaurants like this do not come around very often, and nor do they happen by accident. Jackson Boxer and Andrew Clarke have pooled their considerable experience into a menu of such stark, beguiling beauty that if you took it to an open mic poetry night you could read it top to bottom and receive a standing ovation. Certain phrases attack the senses even if you're not exactly sure what they imply - "soy butter", "buckthorn mollases", "tuna bone caramel", "XO crumb", and the less the menu explains, the greater is the desire to discover them for yourself. Attention to detail - precise, exquisite attention to detail - is everywhere, even when a dish is literally no more than a product of clever sourcing, such as this Noir de Bigorre ham, sliced to order into soft, salty, nutty folds. Noir de Bigorre ham has apparently been produced in the countryside around Lourdes for longer than the Iberico pigs from Spain, and though nothing is likely to beat a top bit of Belotta to my heart any time soon, this certainly gave it a run for its money. If you're anything like me you will fiercely resist anyone mucking about too much with oysters, and though I have enjoyed the odd baked bivalve in my time - most recently at the short-lived offshoot of Mien Tay Mrs Le's - usually I want nothing more than a squeeze of lemon. But here are St Leonard's dressed Lindisfarne to completely change everyone's mind on the subject. Wild black pepper infused pickling liquor (I mean try not loving that concept, I dare you) and pickled garlic scapes complimented and elevated the lean oyster flesh to create an extraordinary mouthful of fresh, briney sweetness. I never want oysters any other way again. Then, a cherrystone clam, its shell shining blue like fine Wedgewood pottery, dressed in a smoky, earthy Sichuan peppercorn oil and topped with daintily chopped spring onions. All St Leonard's strengths were on display in this one bit of seafood - the playful use of Asian spices, the interesting and rarely-seen main ingredient, the beautiful and precise presentation. Some neat oblongs of mackerel next, their silvery skins glittering beneath dandelion stalks. Underneath, a layer of dense, umami-rich soy dressing - "soy butter" - which I did my best to mop up with the mackerel before finally resorting to using my fingers. I didn't care if anyone was watching. "Chawanmushi" is apparently a kind of savoury custard, here combined with foie gras for extra levels of meaty decadence. On top sat a few pieces of smoked eel - always impossible not to love - and crunchy pieces of pork skin. So foie gras, smoked eel and pork scratching. Together. Yes, it was brilliant. Sweet baby onions, charred on the hearth, would have been a decent little snack even of themselves, and actually quite similar to a course at famous Scandi weeds-and-pickles restaurant Noma I had a couple of years back. But here they came on something called "tuna bone caramel", which I can best describe as possibly the greatest fish-based sauce you'll ever taste in your life. God knows how many laborious techniques go into its production, or how many grinding man hours, but the result is a thick, dark sauce somewhere between bagna cauda and treacle, so dangerously addictive it should come with a parental advisory sticker. There are few things more reliably rewarding than a bit of charcoal-grilled bavette, even when not particularly good quality beef. Of course St Leonard's use the best beef they can get their hands on - from Swaledale of Skipton - and so the result is a tender, powerfully-flavoured dish, overhung with woodsmoke and topped with grated cured bonemarrow for bonus beef. Maybe I don't need to say anything about the next dish. Maybe all you need is the photo above, for an object as overwhelmingly beautiful as that to do all the talking. Or maybe all you need are the words "monkfish, buckthorn mollases, beach herbs" and you can let your mind fill in the details of the firm, blinding white flesh glazed in sweet syrup, the ethereally light hollandaise underneath, the pile of salty succulents above, plump with freshness and life. As much as any dish at St. Leonard's should be a must-order - and there's some competition for that particular role - I'd wager you'd leave with the greatest regret leaving not having tried this bronzed beauty, an absolute masterclass in fish cooking. Sorry, perhaps I need a second to compose myself. I should try and offer a bit of balance, some sour lemon to cut through the oozing cheesecake of hyperbole. OK then, here you go - the rhum baba wasn't very good. Dry and woolly, it was certainly soaked with a generous amount of rum but the alcohol could still not prevent the sponge from sticking to the roof of my mouth. So, yeah, St. Leonard's isn't perfect. But "salt caramel & East India sherry tart with cardamom ice cream" was perfect, displaying a willingness for bold experimentation that had been a feature of the savoury courses. With an expertly-judged smooth, light filling and great soft ice cream, it was everything you'd need in a caramel tart. I began this post with the desclaimer that St. Leonard's has no intriguing backstory, no rags-to-riches journey from street food to bricks and mortar, no heartwarming reality TV triumph against adversity. For lazy restaurant bloggers and overworked food journalists the lack of a "hook" could mean it doesn't grab the attention - or headlines - as much as other places. It doesn't even have a car lift to accommodate paparazzi-shy celebrities. But the very fact that St. Leonard's isn't an "accident" or an "experiment", and has no eye-catching gimmicks, could perhaps in the end be the very reason for its success. It exists because certain people want it to exist, and because those same sickeningly talented individuals have nailed, at every turn, everything that makes a restaurant great, while ignoring any irrelevant extra bells and whistles that don't. Make no mistake, there's every bit as much of a revolution going on here as in that strange dark space above a pub in New Cross back in 2011, or at the end of a two-hour queue in Borough, but hiding in plain sight as a "normal" restaurant in Shoreditch means that St. Leonard's stands even more of a chance of knocking you sideways. It certainly did me. And it's only a matter of time before it does to you, too. I visited St. Leonard's at the tail end of soft opening, so received 50% off the bill as you can see above. A more normal price per head would have been about £80.